IRBIL, Iraq (CNS) — The head of the Vatican’s Congregation for Eastern Churches visited Iraq to convey Pope Francis’ blessing and concern for church officials and the displaced living and working in difficult circumstances. The Mass’ main celebrant was by Syriac Catholic Patriarch Ignatius Joseph III Younan, but Cardinal Sandri preached. In his homily, he spoke of the massacre of Assyrians by the Ottoman Empire a century ago. Before going to Irbil, Cardinal Sandri spent three days in Baghdad, where he met with Iraq’s president and prime minister. Iraq without Christians would not be Iraq anymore, Prime Minister Haider al-Abadi told him, echoing Pope Francis’ recurring declarations about the Middle East. President Fuad Masum told the cardinal he hoped the pope would visit as soon as the situation will allow it. 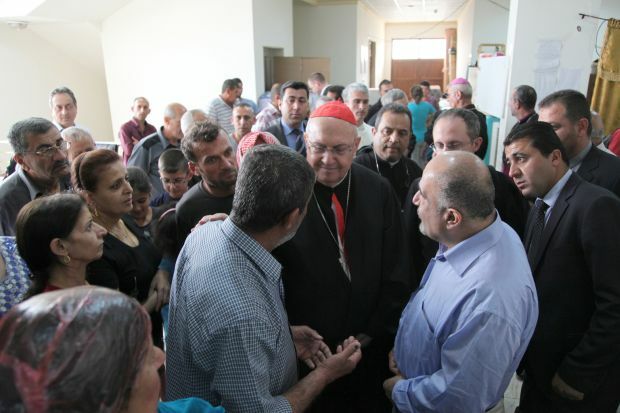 In Irbil, Cardinal Sandri met with about 10 members of ROACO, a coalition of funding agencies coordinated by the Congregation for Eastern Churches. Among them were the heads of French and German agencies as well as Aid to the Church in Need, the Holy Childhood Association and the Catholic Near East Welfare Association. During the two days prior to that meeting, members of ROACO visited many camps with displaced people, trying to evaluate their needs. Last summer, in the face of advancing members of the Islamic State group, more than 100,000 Christians were forced to flee their homes on the plain of Ninevah to reach Irbil and other places in Iraqi Kurdistan. Prefabricated buildings have now replaced the tents hurriedly installed last year. Some displaced people have sometimes been received in improvised lodging, often sharing a few square meters. Schools, kindergartens and clinics were progressively set up, and life was reorganized in the camps, including on a spiritual level. Displaced with the faithful, priests have continued to spiritually nourish their communities, just like many Iraqi Dominican sisters, especially in welcome centers. Despite Iraq’s and the Kurd autonomous government’s support, and despite international solidarity through aid agencies, housing conditions remain difficult. Besides insufficient water, the electrical network is unstable and, this summer, temperatures could climb up to 122 degrees Fahrenheit.